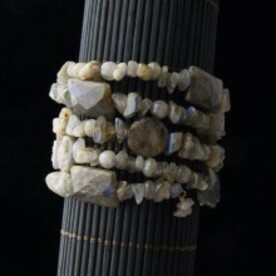 Fabulous pieces of “A” quality cut and polished labradorite stone, handstrung on memory wire. Such sweet beads, rectangle diamond cut along with flat disk and natural cut pieces make up this stunning bracelet. Match it up with our two different matching earrings.